Freak out the kids, friends and family with a gory, ghoulishly delicious appetizer dessert brain, molded to scare! For even more outrageously icky fun, use to mold ice cream, cheese balls, dips, appetizers, or as an ice mold for a punch bowl! Garnish with gummy worms, whipped cream 'puss' or red jam or jelly 'blood'!!! 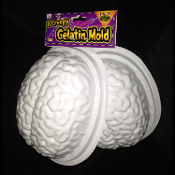 The large adult size brain mold makes realistic scary edible brains out of flavored JELL-O or other brand dessert gelatin. Each mold comes with directions and a recipe for flesh tone brain, but, can be made in any thrilling color to suit your scary Halloween theme. Molded Plastic life-size, anatomically correct brain mold. Fill the plastic brain mold with a customized gelatin mix and a few hours later, out pops a life-size, anatomically correct brain. Disgustingly Delicious! Finally, what the world has been waiting for. . . spooky edible brains without all the hassle and mess of a zombie apocalypse. There’s no need sitting around waiting for the collapse of civilization or digging up graveyards in the middle of the night, when all you need to do is spend a little time in the kitchen. Use your choice of gelatin, aspic, cheese, solid dips, etc. A wiggly gelatin brain is educational - you can identify the functions of the different parts of the brain as they slide down your throat. Entertain and impress your friends as you re-enact scenes from Night of the Living Dead. Make a batch of brains for your next zombie walk to add some deliciously disgusting realism to the event. Not only are they easier to come by, gelatin brains are also much less fattening than the real thing. Fits well as a lid for the Bleeding Zombie Head Bowl #HH-FM-64609, sold separately !!! Also great as a crafts form or mould for many different anatomical uses... Just what the Doctor ordered! BRAINS... BRAINS... Must Eat BRAINS!!! Scream at your own RISK! Works with: Chocolate, Low Temp M&P Soap, Plaster, Butters, Cremes, Ice and mostly any other LOW TEMP molding. *Please Note: Packaging may vary from photo.